Continuing his relentless tearing apart of the Holy Faith, the revolutionary named Jorge Mario Bergoglio/Francis, who is ever so humble, you know (and if you don't, he will tell you), explained in of his impromptu sermonettes during the staging of the Protestant and Masonic Novus Ordo liturgical service on April 25, 2013, the Feast of Saint Mark, that the Gospel must be preached without a "spirit of conquest:"
The Pope presided over Mass this morning, the feast of the Evangelist St. Mark, at the Domus Sanctae Marthae. Among those present were members of the Secretariat of the Synod of Bishops, accompanied by their secretary general, Archbishop Nikola Eterovic. Perhaps Emperor Constantine must have misread that sign in the sky on October 28, 312, before the Battle of Milvian Bridge against Emperor Maxentius. Yes, Emperor Constantine saw a Cross in the sky above the following words: In hoc signo vinces" ("In this sign you will conquer") as conquest has nothing to do with the apostate work of the counterfeit church of conciliarism. Our Blessed Lord and Saviour Jesus Christ, Whose very Holy Cross was found on this day by Sant Helena, the mother of Emperor Constantine to whom that sign in the sky had been given, wants us to conquer the force of the world, the flesh and the devil in our souls on a daily basis. He wants us to help others to do so. 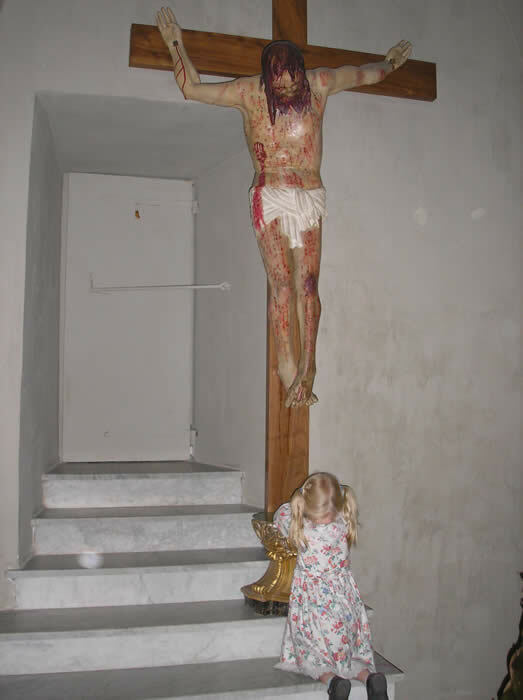 Yes, the battle for the sanctification and salvation of our immortal souls, redeemed as they were by the shedding of every single drop of Our Blessed Lord and Saviour Jesus Christ's Most Precious Blood on the wood of the Holy Cross, is a daily conquest, one that we cannot achieve on our own power whatsoever. We must rely upon the ineffable graces He won for us on the wood of that Holy Cross and that flow into our hearts and souls through the loving hands of Our Lady, she who is the Mediatrix of All Graces. The battle for Christendom was won both by shedding of the blood of the early martyrs, including the saints we commemorate today--Pope Saint Alexander and Saints Theodulus, Eventius and Juvenal. The blood of the martyrs is indeed the seed of Holy Mother Church. And this is charity, that we walk according to his commandments. For this is the commandment, that, as you have heard from the beginning, you should walk in the same:  For many seducers are gone out into the world, who confess not that Jesus Christ is come in the flesh: this is a seducer and an antichrist. Look to yourselves, that you lose not the things which you have wrought: but that you may receive a full reward. Whosoever revolteth, and continueth not in the doctrine of Christ, hath not God. He that continueth in the doctrine, the same hath both the Father and the Son. If any man come to you, and bring not this doctrine, receive him not into the house nor say to him, God speed you. Nor say to him, God speed you: This admonition is in general, to forewarn the faithful of the dangers which may arise from a familiarity with those who have prevaricated and gone from the true faith, and with such as teach false doctrine. But this is not forbidding a charity for all men, by which we ought to wish and pray for the eternal salvation of every one, even of our enemies. It's kind of tough to have a "respect for life" while one is blaspheming its very Author with false worship. Indeed, it is absolutely impossible to create a "climate of peace to love, defend and promote life" by generating a "spiritual rebirth" unto the devil himself. Yes, there can be spirit of "conquest" in dealing with adherents of false religions, who must be referred to as "believers" by the figures of Antichrist in the counterfeit church of conciliarism. Other sects are almost openly permissive of abortion. "Christians and Buddhists" have a profound respect for human life"? This is a lie from the liars in the counterfeit church of conciliarism. The year 1940 was just seventy-one years ago. The Buddhists have changed in the past seventy years? Go tell that to the Catholics in parts of India and Sri Lanka today who are suffering at their hands . Ah, yes, those "peace loving," planet-caring Buddhists. Happy Vesakh? I don't think so. For to do wish a "Happy Vesakh" to those steeped in the false religion of Buddhism would be to violate the First Commandment. "At some point after The Beginning, God Who is Love, stopped playing His harp to look down upon the earth. He looked and saw that His once-glorious creation, man, was suffering and dying, as death is in the nature of the corruptible flesh that man willingly took on as a result of his own (ahem) sin; a sad and pitiable (if not completely undeserved) end for His creatures! And God, in sympathetic solidarity and love, was very sorry for that, so, shaking His head, closing His eyes, and giving a 'tsk-tsk', He determined to send His Son, Jesus Christ, Who is Love personified, to minister and to preach the Word of solidarity to mankind in a place called Galilee. And it came to pass one day during His preaching ministry which nobody paid much attention to otherwise, that Jesus said: "I am sent by My Father to announce great news to you: if it will make you feel better about the dreadful fact you have to die, I'll die, too, for love of you. And you know what else?......I'll go it one better (because I'm nothing if not fair! ): I'll die in unspeakable pain and abject disgrace (unlike most of you), though I've done nothing to deserve it (also unlike most of you......but never mind that.) Remember always: love is the word and solidarity is love". The Word got around, and the people said: "yay!" And, seeing the people's response of joy and approval Jesus said further: "My love for you in doing this is so great, it will not only allow you to experience Me as warmer and more approachable; it will, if we try hard enough in our minds and hearts to make it so, remove the once-necessary inequality between Me and you; we will be fellow-travelers in every way which you will find delightfully freeing, I think". "But here's the good part: since lack of love (never forget: love = solidarity) is the real sin, it follows that as I've brought that love to you, neither of us will have to deal anymore with the work connected with your overcoming the (eye roll) eternal consequences of sin; no wasting your time asking My forgiveness or doing penance, no wasting My time listening to your drama and forgiving you (that reminds Me, the apostles will have to scratch that command about "whose sins you shall....yada yada"); for verily, my friends, I tell you: I will have to leave you ere long, and when I do, I will be booked solid; for starters there's serious fishing where I'm going (you'd love it - the biggest ones you can imagine! ); also canasta afternoons with the saints, bowling nights with the angels and who knows? - maybe even a couple rounds of golf with a president or two, or an important get-together with all the heads of the UN in a few millennia! Not to mention I'm sure you fine people are busy with your stuff down here, as well. And of course you'll join Me where I'm going when your time comes." "Then Jesus and the people, happy with their solidarity, hugged a big group-hug and they all said "Live, laugh, LOVE"! Postscript: shortly thereafter - and strangely inexplicably - the Galileans expunged from the Holy Gospel this salutary story of why God's Divine Son Jesus Christ, their beloved Master, died, and substituted a fake one which describes His death with all seriousness and gravity as some act of 'redemption' or 'atonement'. Go figure! ......And thus it remained for some 2000 years until Robert Zollitsch, having no agenda whatsoever for a revisionist claim, came along and discovered the real truth which has just been testified to! Almighty God in the 3 Persons of the Holy Trinity is/was not Zeus uncharacteristically stricken with remorse over his ill-treatment of humanity. Last but not least: the "Innocent One" did not deserve death but we do as a consequence of our sin! That is exactly what made Him the Unblemished Lamb of Sacrifice Who opened Heaven's gate to us because we couldn't by our own nature do it ourselves. As for all those out there in NOVO land: read and see that your leaders are fairy-tale spinners who've been working the shuttles for more than 50 years! Wake up! Rip van Winkle and Princess Aurora finally did. I think that you will agree with me that this is a truly powerful summary of the essence the essence of the conciliar religion's penchant for the slogans "love" and "solidarity" that have nothing to do with of conquering souls and lands for Christ the King and His true Church. We know, of course, that In hoc signo vinces ("In this sign you will conquer"). This glorious work was accomplished and the Church was put in possession of the instrument of the world's Redemption. Both East and West were filled with joy at the news of this precious discovery, which heaven had set on foot, and which gave the last finish to the triumph of Christianity. Christ completed his victory over the pagan world by raising thus his standard--not a figurative one, but his own real standard--the Cross, which, up to that time, had been a stumbling-block to the Jews, and foolishness to the Gentiles; but before which every Christian is henceforth to bend his knee. Helen placed the holy Cross in the Basilica which had been built by her orders, and which covered both the glorious Sepulchre and the hill of the Crucifixion. Another Church was erected on the site where the Cross had lain concealed for three hundred years, and the faithful are enabled, by the long flights of steps, to go down into the deep grotto which had been its tomb. Pilgrims came from every part of the world to visit the hallowed places where our Redemption had been wrought, and to venerate the sacred Wood of the Cross. But God's merciful providence willed not that the precious pledge of Jesus' lover for mankind should be confined to sanctuary only, however venerable, it might be. Immediately after the discovery, Helen had a very large piece cut from the Cross; and this fragment she destined for Rome, the new Jerusalem. The precious gift was enshrined in the Basilica built by her son Constantine in the Sessorian garden, which was afterwards called the Basilica of the Holy Cross-in-Jersualem (Basilica di Santa Croce in Gerusalemme). By degrees, other places were honoured by the presence of the Wood of the Holy Cross. 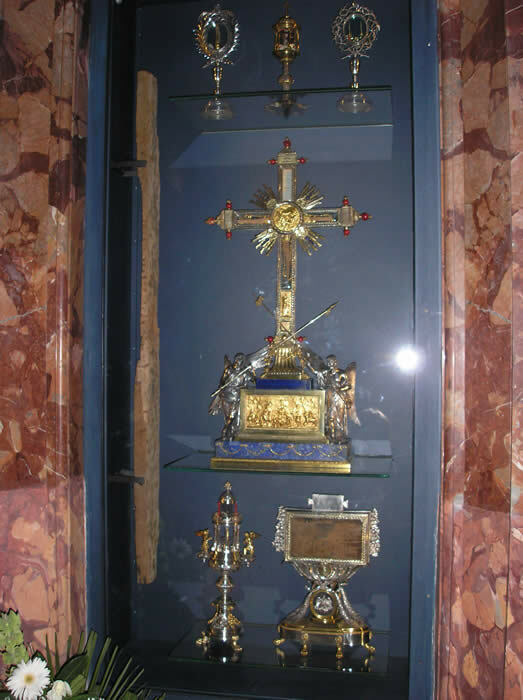 So far back as the fourth century, we have St. Cyril of Jerusalem attesting that many of the pilgrims used to obtain small pieces of it, and thus carried the precious treasure into their respective countries; and St. Paulinus of Nola, who lived in the same century, assures us that these many gifts lessened not the size of the original relic. In the sixth century, the holy Queen St. Radegonde obtained from Emperor Justin II a large piece of the fragment that was in the imperial treasury in Constantinople. It was for the reception of this piece of the True Cross into France that Venantius Fortunatus composed the Vexilla Regis--that beautiful hymn which the Church uses in her Liturgy as often as she celebrates the praise of the Holy Cross. After several times losing and regaining it, Jerusalem was at length for ever deprived of the precious relic. From Constantinople was a gainer by Jerusalem's loss. From Constantinople, especially during the Crusades, many churches of the West procured large pieces. These again supplied other places; until at length the Wood of the Cross was to be found in almost every town of any importance. There is scarcely to be found a Catholic, who, some time or other in his life,, has not had the happiness of seeing and venerating a portion of this sacred object. How many acts of love and gratitude have not been occasioned by this? And who could fail to recognize, in this successive profusion of our Jesus' Cross, a plan of divine providence for exciting us to appreciation of our Redemption, on which rests all our hopes of eternal happiness? That thou mightest the more effectually draw us, thou this day permittedst us to find the very Wood, whereon thou didst stretch forth thy divine arms to embrace us. Thou has deigned to give us this holy instrument of thy victory which is to shine near thee in the heavens on the day of judgement; thou hast mercifully confided it to our keeping, in order that we might thence derive a salutary fear of divine Justice, which demanded thy death on this Wood in atonement for our sins. Thou also gavest us this most precious relic, that it might excite us to a devoted love for thee, O divine Victim! who, that we might be blessed, didst take upon thyself the maledictions due to our sins. The whole world is offering thee to-day its fervent thanks for so inestimable a gift. Thy Cross, by being divided into countless fragments, is in all places, consecrating and protecting by its presence every country of the Christian world. "Friends of the Cross, disciples of a crucified God, the mystery of the Cross is a mystery unknown to the Gentiles, repudiated by the Jews and spurned by both heretics and bad Catholics, yet it is the great mystery which you must learn to practice at the school of Jesus Christ and which you can learn only at His School. You wold look in vain for any philosopher who taught it in the Academies of ancient times; you would ask in vain either in the senses of reason to throw any light on it, for Jesus alone, through His triumphant grace, is able to teach you this mystery and make you relish it. We must give thanks to God at all times for each of our crosses as we seek to serve Him through Our Lady in this time of apostasy and betrayal, remember the words in the sky that were seen by the son of Saint Helena, the Emperor Constantine: In hoc signo vinces, in this sign, you shall conquer. Pope Saint Alexander, pray for us. Saint Theodulus, pray for us. Saint Eventius, pray for us.